Beginners welcome! First 2 classes for each martial art are FREE! We teach people to defend themselves in the hope that they will never need to. Better to have trained in martial arts and never need it, than to need it and have never trained. Wing Chun & Jiu-Jitsu Melbourne is conveniently located in Bundoora, a north eastern suburb of Melbourne. We have 191 car parking spaces! We are close to public transport! Learn Wing Chun Kung Fu, the Chinese martial art that Bruce Lee made famous. Learn Gracie Jiu-Jitsu, the Brazilian martial art that changed martial arts forever. Combine the two and master self-defence techniques on the feet and on the ground. 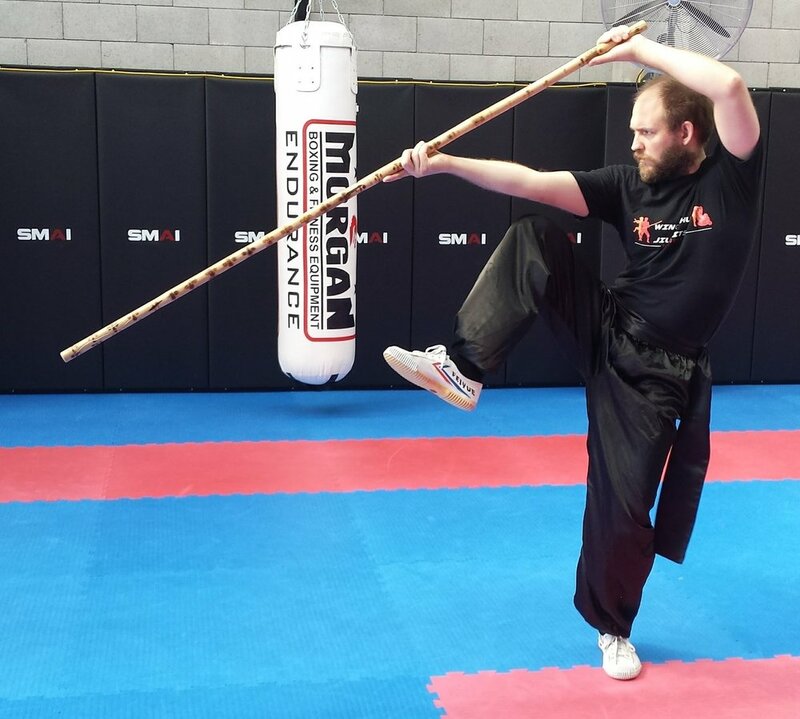 Learn Wing Chun Kung Fu traditional weaponry forms: how to use Butterfly Swords (Bart Jarm Dao) and a Dragon Pole (Luk Dim Boon Kwan) in a combat situation. The martial arts techniques we teach are effective for anyone regardless of age, gender, size or athleticism – because we always assume you are defending against a larger, stronger and more agile opponent. Our School is about realistic training and the pursuit of excellence in self-defence. Bruce Lee with his teacher, Wing Chun Grand Master Yip Man. We don’t just teach technique. We emphasise the importance of timing and positioning, and how even perfect technique will fail if you don't learn when and when not to use it. Come train in a family-friendly environment, where people of all ages and experience are encouraged to learn how to protect themselves. You are guaranteed to make new friends in a welcoming and safe atmosphere. Martial arts training is recommended as a way of improving personal well-being and better mental health. It can help ease stress and anxiety. It can act as a safety-valve to relieve the pressures of work. Our School emphasises the importance of mastering skills at every level. Students should not expect to grade quickly unless they are properly qualified. If you are awarded a belt for having reached a recognised level of skill, you will know that you have genuinely earned it. Declan with Gracie Jiu-Jitsu Master Pedro Sauer. The martial arts we teach are not just self-defence systems, but a lifestyle choice to keep stimulated, fit and healthy. In the words of Gracie Jiu-Jitsu Master Pedro Sauer, you can “Change your body, your mind, your life”. Classes are taught by three-time National All Styles Victorian State Champion Declan Eipper. · Traditional Wing Chun Kung Fu black belt (2016). · Four-stripe blue belt in Gracie Jiu-Jitsu (2015). · Grand Master Yip Man Wing Chun lineage. · Grand Master Helio Gracie and Master Pedro Sauer Gracie Jiu-Jitsu lineage, focused on self-defence. Learn self-defence skills that could save your life!